Description: Peridium (outer skin) covered in small, not very prominent warts, black in colour. Gleba (pulp) black/violet with fine white veins that tend to become reddish when exposed to the air. 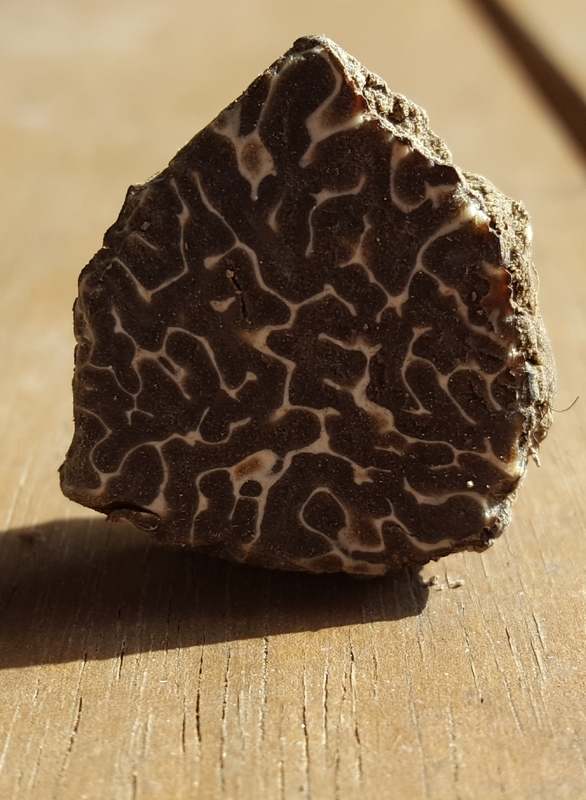 This is a very special truffle and only grows here in Marche/Umbria. 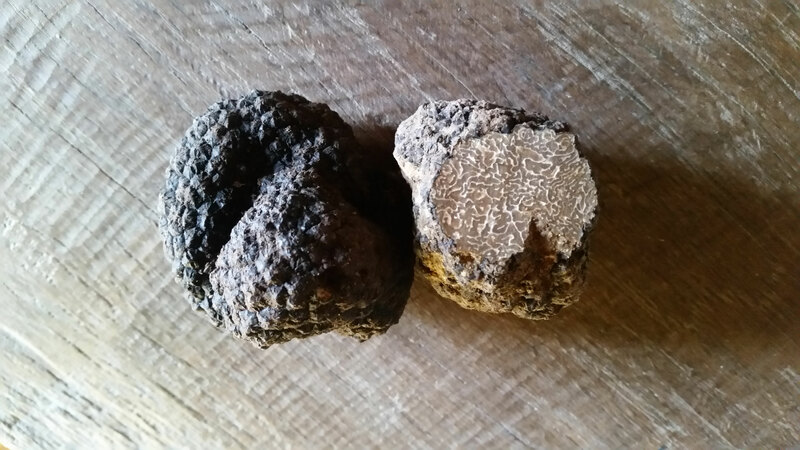 The red clay soil, gives this truffle a sweet, unique aroma. 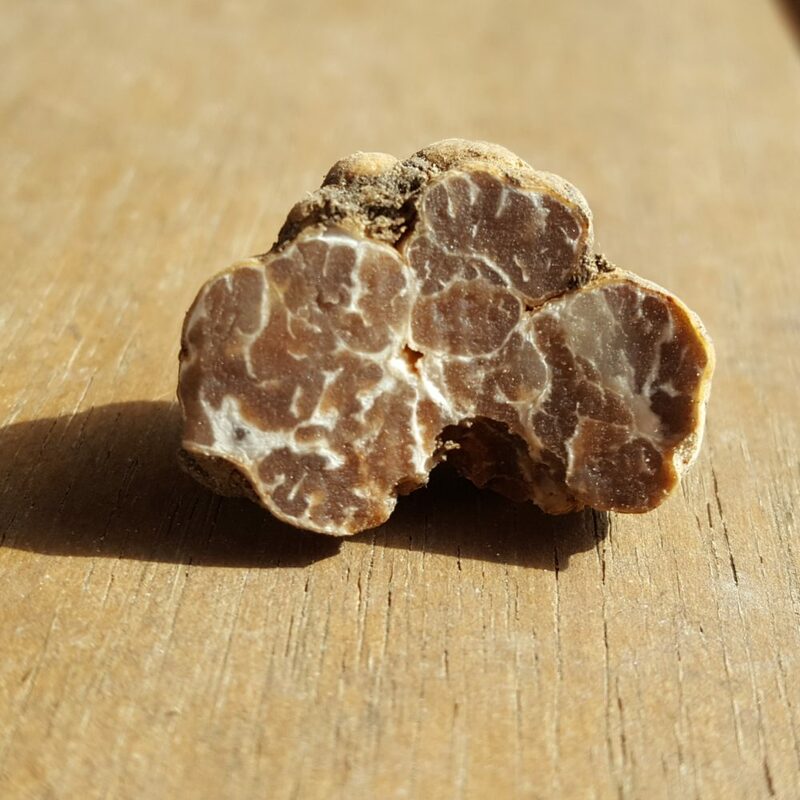 Aroma: Sweet scent, fruity and slightly spicy – this truffle has a unique aroma due to the characteristics of the Marche/Umbria soil. Gathering Season: From November to March. Habitat: The Precious Black truffle grows in symbiosis with oak and the holm oak. It is sometimes found near hazel trees. Description: Peridium (outer skin) soft and smooth, black in colour. Gleba (pulp) dark brown with thick white veins. Habitat: The Brumale is a resistant truffle and grows in humid environments. It typically grows in symbiosis with oak and Hazel. Description: Peridium (outer skin) soft and smooth, white in colour with dark patches or spots. Gleba (pulp) honey brown with thick white veins. Habitat: The Borchii is a resistant truffle and grows in humid environments. It typically grows in symbiosis with oak and Hazel and in the same areas as Tuber Brumale. Description: Peridium (outer skin) smooth and light yellow in colour. Gleba (pulp) pale yellow, hazelnut or brown tones with very fine white veins. Aroma: Sweet cent of cinnamon, acacia honey and freshly dried hay. Gathering Season: From early October to late December. Habitat: The Precious White truffle is located in forests or its borders and in isolated plants. It grows in symbiosis with lindens, poplars and willows (along streams and rivers), oaks, black hornbeams and hazels. Description: Peridium (outer skin) covered in protruding warts, slightly smaller than Black Summer. Gleba (Pulp) Chocolate with yellowish tones, fine white veins. Aroma: Sweet and nutty tones with a hint of fresh mushrooms. Gathering Season: From October to December. Habitat: The Black Autumn truffle grows in symbiosis with a mixed forest of oak and black hornbeam. Description: Peridium (outer skin) covered in protruding warts, that are rough and pointed at the ends, black in colour. Gleba (pulp) Brown with yellowish tones, fine white veins. Aroma: Sweet scent of mushrooms and fresh hazelnuts. Gathering Season: From early June to late August. Habitat: The Black Summer truffle is located in forests or glades, or near hedges and thorn bushes. It thrives in a sunny environment. The Black Summer grows in symbiosis with the oak and hazel. 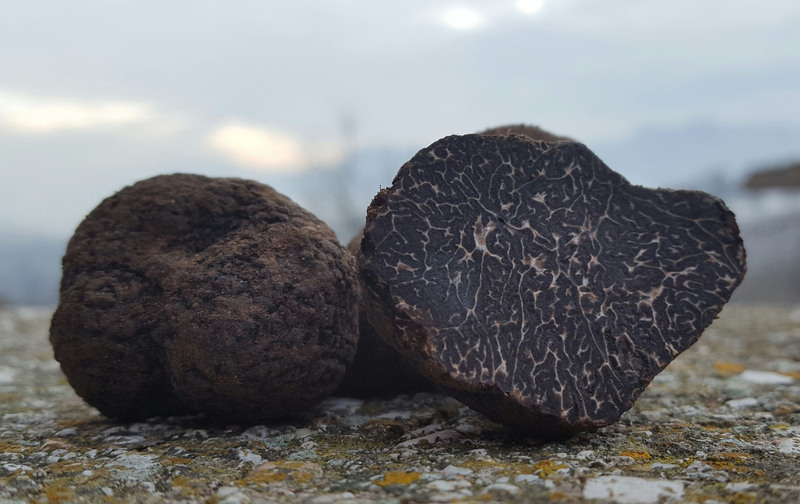 Blue Mountain fresh truffles prices may vary from year to year, due to seasonal nature of production; this mainly depends on climatic conditions; such as rainfall, summer temperature and local conditions, which can cause price variations during production season. All of our seasonal truffles are sourced from our Blue Mountain land, Italy. 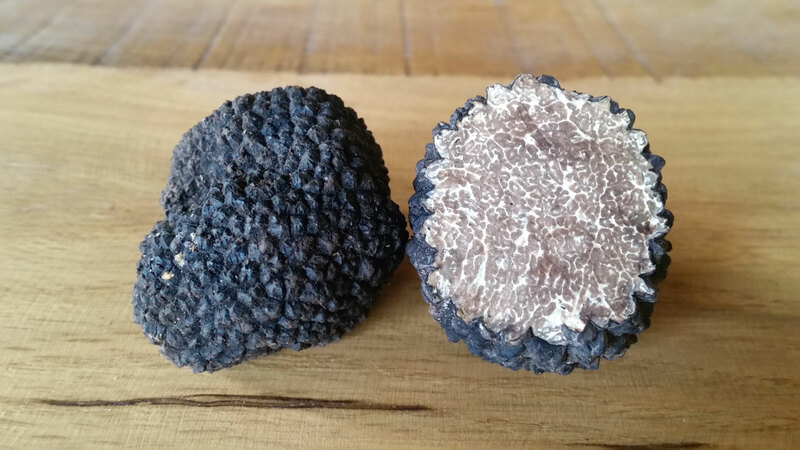 Our Truffles are of excellent quality, guaranteeing exceptional taste, shape and freshness. Blue Mountain Truffles will be freshly delivered to you within 24/48 hrs of your purchase, depending on your location. 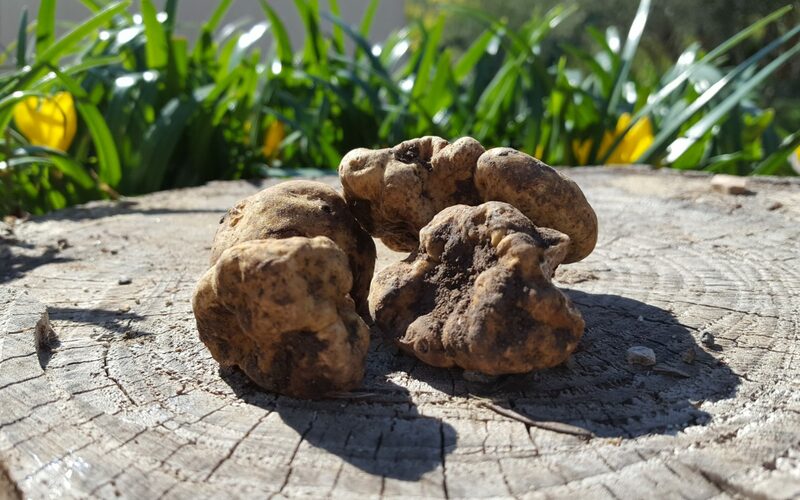 Please contact us for more information or to receive our seasonal truffle price lists.